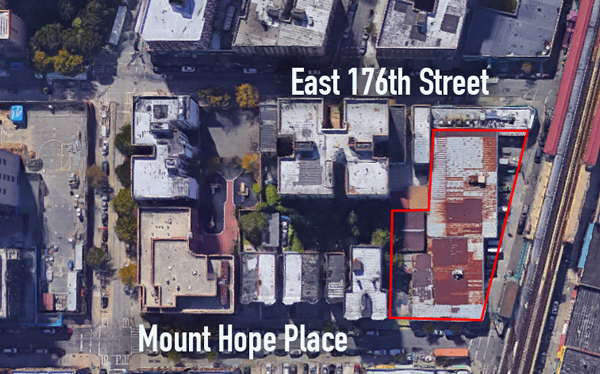 Bronx developer Sam Kafif plans to replace a one-story retail building in Morris Heights with a large mixed-use development featuring 119 residential units. The project will be located at 2 Mount Hope Place and span slightly more than 136,000 square feet, according to plans filed Thursday with the city’s Department of Buildings. It will feature 20,620 square feet of commercial space and a 15,395-square-foot community facility in addition to the 98,718 square feet of residential units. The building was formerly Uptown Hardware Supply and spans from West 176th Street to Mount Hope Place along Jerome Avenue. It has an alternate address of 1840 Jerome Avenue. Kafif, who did not respond to a request for comment, also owns the Bondi Department Store at 1412 Jerome Avenue, and he is constructing a seven-story residential building at 411 East 151st Street as well. Morris Heights has seen a flurry of activity over the past few months. Investor Arjan Gjushi recently filed plans for a 94-unit residential building at 29 Featherbed Lane, and Josh Gotlib’s Black Spruce Management purchased a 99-unit residential building in the neighborhood at 1765 Townsend Avenue for $26 million in February.